Last year L’Acadco – A United Caribbean Dance Force celebrated a successful 25th staging to sold out enthusiastic audiences. 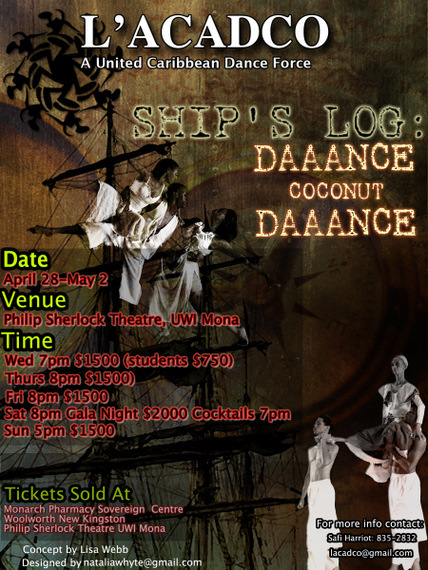 This year the company presents “SHIPS’ LOG – Daaance Coconut Daaance,” a historical account of our heritage from slavery to present day. This season will take place at the Philip Sherlock Theatre, UWI Campus from Wednesday, April 28th to Sunday, May 2nd, 2010. L’Acadco’s will be sharing part proceeds of this event with the La Maison l’Arc en Ciel (Rainbow House) orphanage in Haiti, as the island continues to recover from its recent earthquake. Artistic Director, Dr. L’Antoinette Stines, strongly believes that the arts can and should be used to forge bridges across the Caribbean and this is one such tangible way. This year L’Acadco is featuring a special guest performance by Jamaican dance stalwart Ms. Patsy Ricketts, who remains a great influence on the Jamaican performance arena. Ms Ricketts has been instrumental in the early shaping of Jamaica’s dance image both locally and internationally. Her efforts include work with institutions such as the National Dance Theatre Company, Stella Maris Dance Ensemble, Excelsior Community College, L’Acadco and more recently the Rising Stars competition, to name a few. Ships’ Log – Daaance Coconut Daaance will celebrate and showcase choreography from Dr. L’Antoinette Stines, Amanyea Stines Jones, Aaron Vereen, Arsenio Andrade, Adrianne Wanliss, Barbara Ramos-Caballeros and Jaqueline Logan. All other nights and regular price is $1500. YardEdge » YardEdge is Two Years Old!